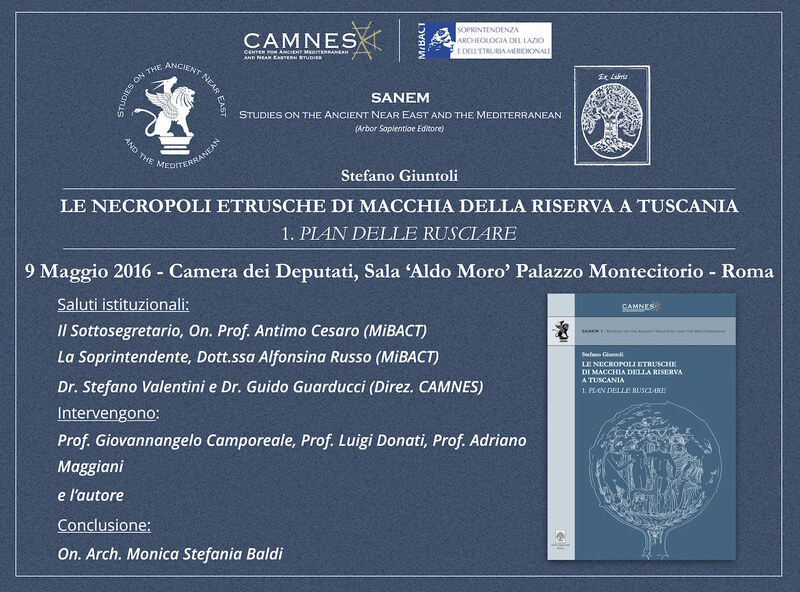 May 9, 2016 - Presentation of 1st volume of the SANEM series, 'The Etruscan Necropolis of Macchia della Riserva in Tuscania 1. Pian delle Rusciare' of Stefano Giuntoli, at the Chamber of Deputies in the Hall 'Aldo Moro', Palazzo Montecitorio, Rome. On Monday, May 9, 2016 was officially presented at the Hall 'Aldo Moro' of the Chamber of Deputies (headquarters of the Italian Parliament) in Montecitorio, Rome, the new CAMNES editorial series entitled 'Studies of the Ancient Near East and the Mediterranean' (SANEM) published by the Roman publishing house 'Arbor Sapientiae'. The first volume, dedicated to the CAMNES excavations directed by Dr. Stefano Guintoli, author of the book, is entitled 'The Etruscan necropolis of Macchia della Riserva in Tuscania 1. Pian delle Rusciare' (original title in Italian). The speakers were in the order: the Undersecretary of the Ministry of Heritage and Culture and Tourism (MiBACT), Hon. Prof. Antimo Cesaro; the Superintendent for Archaeology of Lazio and Southern Etruria, Dr. Alfonsina Russo (MiBACT); the co-directors of CAMNES, Dr. Guido Guarducci and Dr. Stefano Valentini; Prof. Giovannagelo Camporeale (University of Florence, CAMNES and SANEM Scientific Committee), Prof. Adriano Maggiani (University Ca 'Foscari of Venice), prof. Luigi Donati (University of Florence), the author Dr. Stefano Guintoli; and to conclude the Hon. Arch. Monica Baldi.